I am currently a professor in a university in the United States and I am originally from the Philippines. Although I finished my basic education and bachelor of science degree in the Philippines, I did spend eight years as a doctoral and postdoctoral student in Illinois. I know of other Filipinos who have chosen the same career path as I have. Filipinos are likewise found in K-12 classrooms across the US. 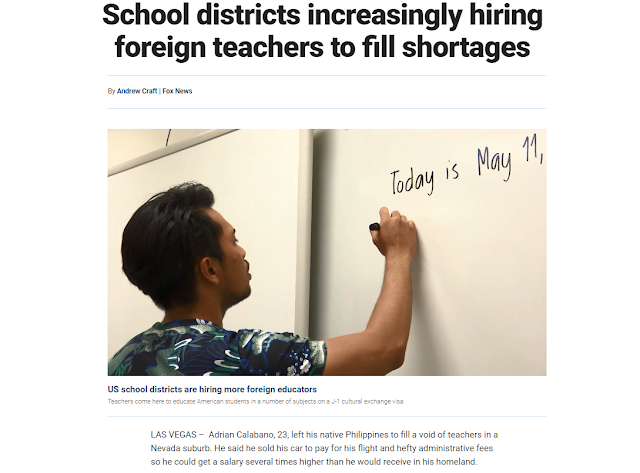 In the past years, schools in the US have been increasingly hiring teachers from other countries to fill shortages that are often in high poverty and more challenging districts. In the Clark County district alone, eighty one teachers have been recently hired from the Philippines to solve the county's special education teacher shortage. Public schools are able to recruit these teachers based on a "culture exchange" program. 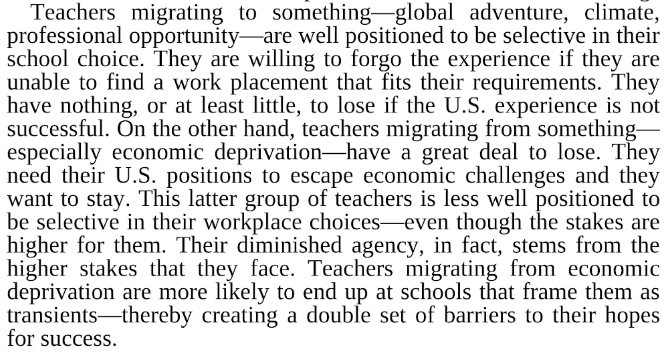 Randi Weingarten, president of the American Federation of Teachers, the largest teachers' union in the US, regards this recruitment as an abuse of the exchange program. Finding special education teachers is a challenge nationwide, Gentry said. Forty-two states reported a special education teacher shortage for the 2016-17 year. That led Clark County officials to consider creative solutions. In April, administrators flew to the Philippines and interviewed 250 candidates, selecting 81. In 2005, the district took a similar trip, hiring 49 teachers. English is one of the national languages in the Philippines, so the teachers already speak English. The J-1 visas allow foreigners to come to the U.S. to teach, study or receive on the job training. Officials can’t say why, but more teachers in the Philippines choose to specialize in special education than in the United States. Teachers in that country make between $5,000 and $7,000, while Clark County’s starting salary is $40,000. At that point, leaving your homeland can become a no-brainer. "We are stealing teachers." 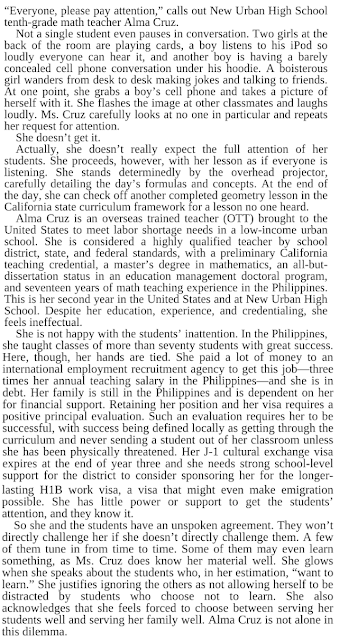 Clark county is indeed taking away teachers from the Philippines where they are badly needed. Since these teachers need to go through a selection process, it is clear that they are not just stealing teachers. They are stealing good teachers. It is a whammy from the Philippine perspective, but it is actually a double whammy especially when these are occurring against the backdrop of teachers' walkouts and strikes in the US. 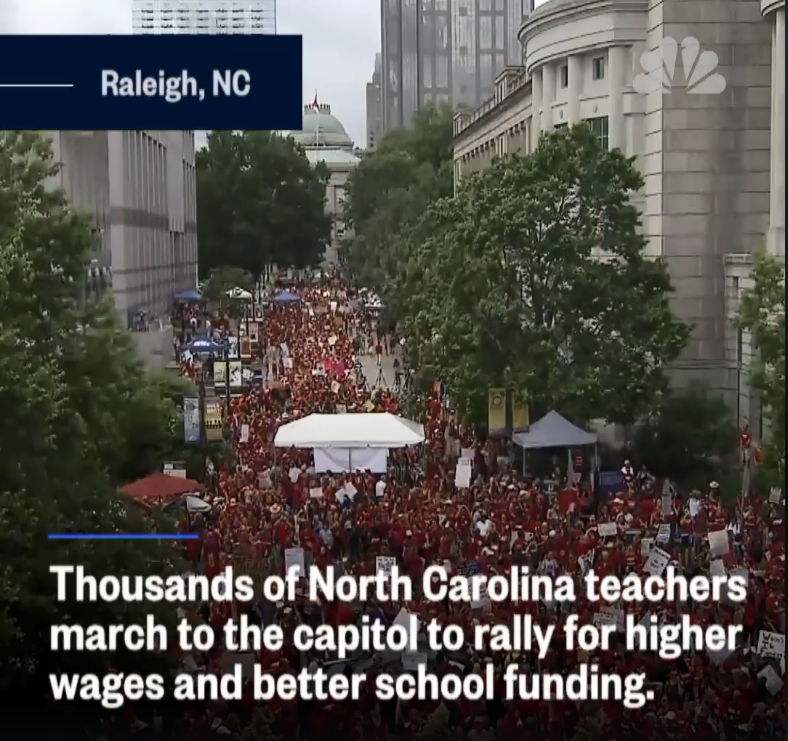 Critics say the foreign teachers don’t hold the same credentials as local educators and are a legal loophole for districts to pay even lower teacher salaries. Plus, critics say, it’s not solving the overall issue – teacher shortages. 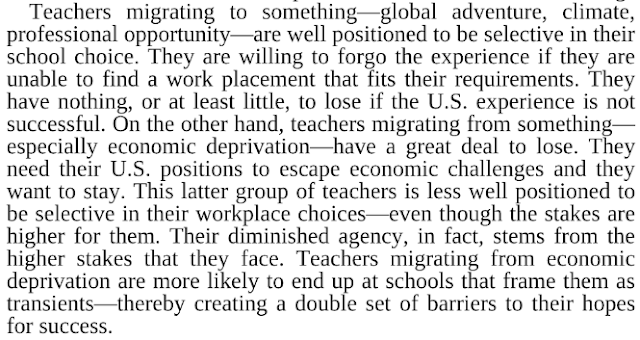 Bartlett further emphasizes the contrast between economically motivated and global adventurers (those that will fit more appropriately the cultural exchange program). "Some of these teachers from Prince George's County who were affected by the debarment are now being hired by charter schools in Southeast DC. According to these teachers,they were hired because the enrollment has increased. The parents have been pulling out their children from DC Public Schools and have brought them to charter schools, prompting the DC chancellor to close down certain SE schools due to under-enrollment. Hopefully, these Filipino teachers will not be "exploited" in these SE charter schools, especially because charter schools have no unions to protect them. These "DC charter schools' Filipino teachers" also came yesterday (they were late), and shared that they work in their schools from 7 am to 7 pm. Some of them cried while sharing their recent teaching experiences in teaching young children in these charter schools. They said that the children are so "rough". One teacher shared that she was hit by a 2nd grader with a chair. The teachers said they just persevere because of their desire to secure their visa status and to be able to continue to provide for their families back in the Philippines. They also have not considered going home to the Philippines yet because most of them have sold their properties in order to travel to the United States. 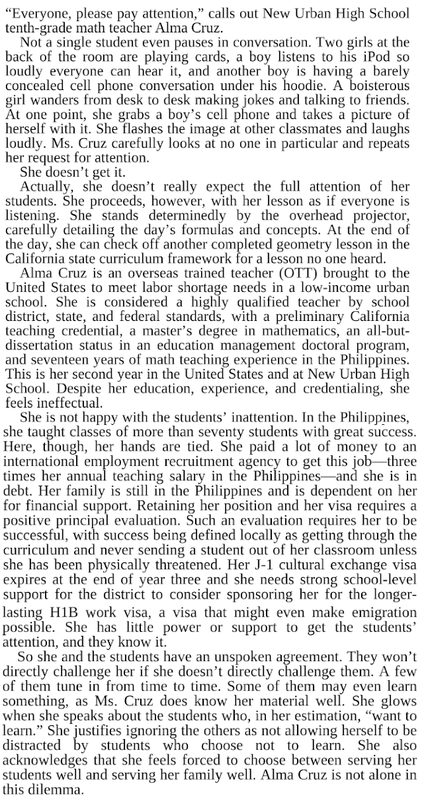 There's so much "sob" stories from these teachers, that I hope someday will be dealt with by our own government in the Philippines." 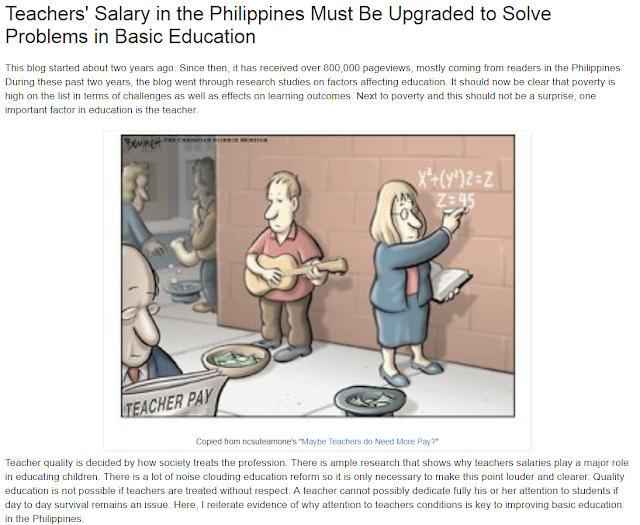 While this blog has emphasized on so many posts the importance of the impact of poverty on basic education, a second major point is the need to increase the salaries of teachers in the Philippines. With the above in mind, there should be no remaining doubt that teachers' salaries need to be raised in the Philippines.